Notes: Guided Tuesday night dive with Pro Dive Coogee. Went with Simon, Ciara, Maria and Johnny. Lead by Tony from the shop. Price: $19 for the tank. Diving: Nice, good vis. A cool decorator crab, baby cuttlefish, a seahorse, leatherjackets. Equipment: Usual own stuff. 24 lb weight (probably more than necessary) for the hood and shallow depth. Notes: A weekend to begin the winter in South West Rocks; the town so-named because some rocks were directly southwest of Captain Cook’s ship at the exact instant that he was inspired to name them, or so we heard. 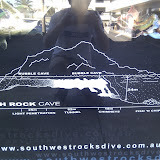 We booked a Fish Rock Cave dive with South West Rocks Dive Centre, having previously had positive experiences with them. Every day that weather permits, they launch their boats into the Macleay river, cross the sandbar to the ocean, sail across Trial bay and south to Fish Rock (passing Green Island along the way–the nomenclature in this region tends to be quite literal). This route (see the map below), incidentally, is why you can’t dive Fish Rock Cave at night; commercial vessels cannot cross the sandbar after dark. There is great fishing enthusiasm in the town. Four-wheel drives with batteries of fishing rod holders abound. Pelicans loiter near the fish-gutting station by the boat ramp. Price: $140 inc. tank and weights ($170, inc. gear rental). Diving: Despite the fine weather, there was much movement in the ocean. The route that we had previously taken through the cave (right to left in the map in the picture) was ruled out because of the (somewhat) narrow chimney at the deep end. Instead, we entered by the shallow entrance and continued for about 25 metres before turning and leaving by the same way. The vis was not good, and there was a lot of movement in the water. We lost Eithne on the way back. The guides went back to search but she was on the boat by the time we surfaced. Surface interval: jellies, biscuits, cup-a-soup and a glimpse of a big turtle. For the second dive, we forewent the cave altogether and had a leisurely meander around some gullies near the rock, where the local nurse shark colony hang out at this time of year. Vis still bad, but a nice dive all the same, with sharks gliding out of the murk. Equipment: Rented tank, weights (18 lb). Own everything else.